Humans have been naming the stars for millennia. The brightest stars were named long ago by people who immortalized their folklore in the heavens, and many of their names are still used today. Centuries later, formal and systematic naming systems were developed when more extensive lists of stars were compiled. The following sections describe in more detail how the stars received their names over the years. You might have heard of some of the more popular stars, such as Sirius, Betelgeuse, and Polaris. These names sound foreign, and they are—their origins are mostly Arabic translations of Latin descriptions. Common names. Credit: Starry Night software. But to add to the confusion, scribes in the Middle Ages reproduced astronomical manuscripts by hand—a method that introduced errors, especially when copying words they did not know. Over time, the process of making copies of copies made it harder to decipher the original meaning of some words. The common names for the brightest stars in the sky date back to ancient myths. Stars were often named after heroes, animals, or components of the constellations they helped form. The folklore of the stars offers a tantalizing glimpse into the associations ancient peoples established with the stars. In all, about 900 stars have common names primarily of Arabic, Greek, or Latin origin. A few star names are relatively modern, however, invented as recently as the 20th century. A few examples of common names are Sirius (Greek for scorching), Thuban (corrupted Arabic for serpent's head), and Betelgeuse, (a copying error from yad al-jauza, meaning the hand of al-Jauza, the "Central One"). Johann Bayer was a German lawyer and uranographer. He was born in Rain, Lower Bavaria, in 1572. Common names are handy for identifying the brightest stars in the sky, but astronomers needed a system for naming all the stars in the sky, including even the faintest ones. The Bayer system is the first of two naming systems that incorporate constellation names into the identification of stars. It names the brightest stars by assigning a Greek letter (Alpha, Beta, Gamma, Delta, and so on) in an approximate order of decreasing brightness, along with the Latin possessive name of the constellation in which the star resides. Bayer Names. 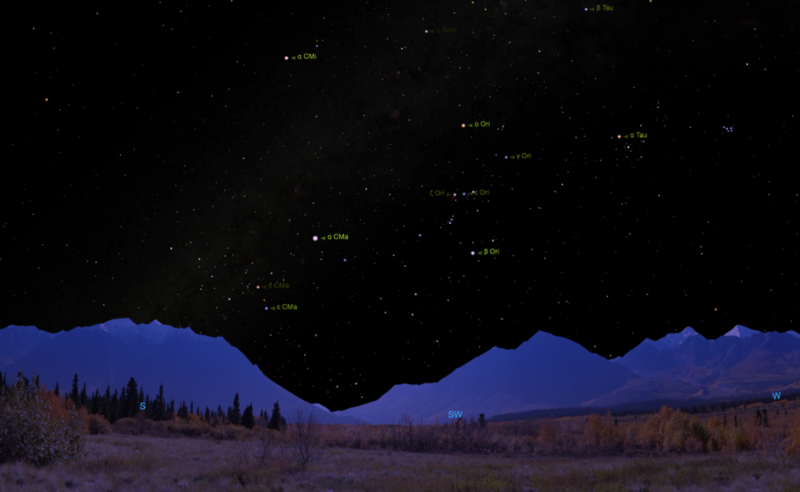 Credit: Starry Night software. In this system, Sirius, which is in the constellation Canis Major, is known as Alpha Canis Majoris. Betelgeuse, which resides in the constellation Orion, is known as Alpha Orionis. The ordering of stars by brightness in the Bayer system is only approximate. As an example, Rigel's name according to the Bayer system is Beta Orionis, suggesting it's the star in Orion just dimmer than Betelgeuse—but it's actually brighter. Brightness fluctuations in Betelgeuse make it brighter than Rigel at times, such as when the system was first introduced in 1603. John Flamsteed was an English astronomer and the first Astronomer Royal. He catalogued over 3,000 stars. The second system that uses the constellations in which the stars reside is the Flamsteed system. The Bayer system was useful for naming the stars—certainly better than using common names—but it had problems. The first was that of fluctuating brightness, as in the case of Betelgeuse and Rigel. The second problem was that there are only so many letters in the Greek alphabet. Unlike the Bayer system, the Flamsteed system can be used to name an unlimited number of stars. In this system, we still use the Latin possessive name of a star's constellation, but this time the stars are distinguished not by their brightness, but also by their proximity to the western edge of their constellations. Flamsteed Names. Credit: Starry Night software. The star closest to the western edge is assigned the number 1; the second-closest star to the western edge is number 2, and so on. For example, the star Sirius is called Alpha Canis Majoris in the Bayer system and 9 Canis Majoris in the Flamsteed system, meaning that it is the ninth-closest star to the western edge of the constellation Canis Major. The faintest of stars are known only by their identifiers in specialized catalogs. These catalogs can contain billions of stars, from the brightest to the very faintest, which can be seen only with powerful telescopes and long exposures. Catalog Names. Credit: Starry Night software. For example, Sirius is bright enough to have a poetic common name, descriptive Bayer and Flamsteed names, and the label HIP32349 in the Hipparcos catalog. You may have read that you can buy a star, or invest in real estate on the moon or Mars. Some companies provide this service to raise funds for science or a charity but others do it only to line their own pockets. Please do your research and be aware that although these companies charge you a fee for an official-looking certificate, these services have no formal validity at all. The scientific community only recognizes naming conventions based on the regulations of the International Astronomical Union (IAU). Remember that the beauty of the night sky is not for sale, and it is free for everyone to enjoy.